Another beautiful sketch. I know what to visit Sweden! I will add it to the list of places to visit. Thanks for sharing all your beautiful sketches and info on the country. Now a few questions…do you sketch in pencil first and then use the pen and ink? What sort of field watercolor kit do you use? And is your sketchbook a watercolor moleskine? Or something else? Thanks Alex! Thank you, Carol! Yes, I start with a pencil (prefer a mechanical pencil). When pencil drawing is down, it’s time for pen. I use Micron Pigma pens as well as a fountain pen, but my intention is to transition out of Micron and use only a fountain pen. For watercolor I use Schmincke 12 half pan travel box, but I added pans to it (there was a lot of room!) and now it has 20 half pans. I am not fully settled on my colors for field sketching and am still fiddling with them. This particular sketchbook with Stockholm sketches is Artist’s Handbook 5.5″ square, I am nearly finished with it. I am not sure yet which one will be my next one, but probably not Moleskine. I have and sketch in WC Moleskine, but don’t like its extreme landscape format, too unwieldy to hold and sketch if you don’t have a table. I am thinking of Stillman & Birn sketchbook as one option and Laloran as another. Hope this helps. If you are interested in Urban Sketching, I can connect you with the NY group. Thanks for the info Alex. 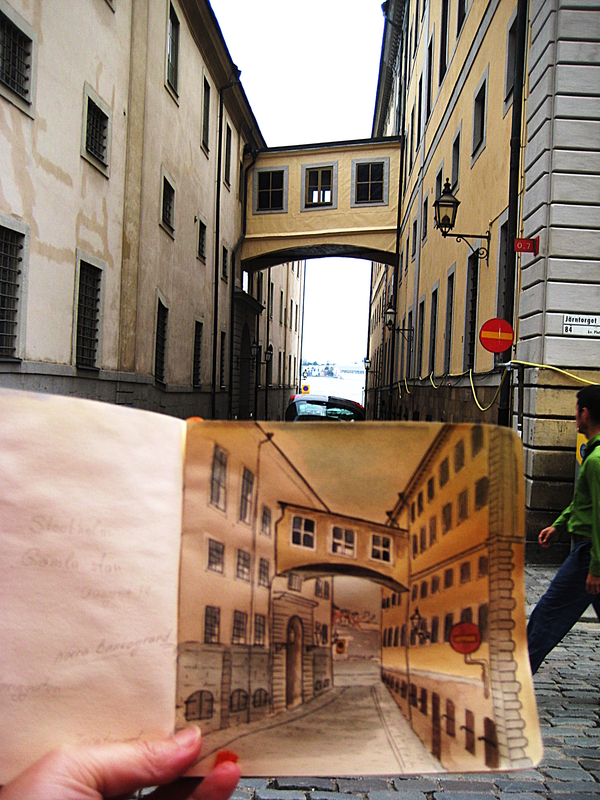 I would love to try some Urban Sketching. Please email me the info on the NY group. I look forward to reading more about your Stockholm adventures. Such nice sketches of a great adventure!